Starcast: Ram Charan, Samantha, Aadhi Pinnisetty, Pooja Hegde, Prakash Raj, Jagapathi Babu, Anasuya Bharatwaj, Rambha, Gauthami, Naresh, Bramahji, Amit Sharma. 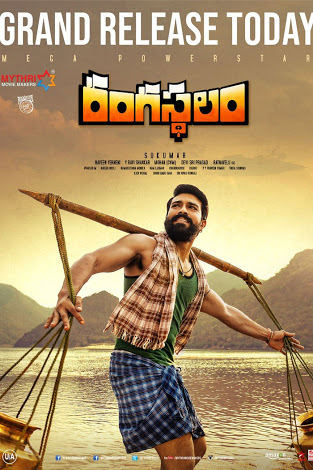 Sukumar’s Directorial “‘Rangasthalam” released today amidst high expectations, featuring Ram Charan and Samantha in lead roles. Despite the high expectations, this film not only crosses them but also stuns everyone with every frame. Sukumar has carved out every frame so carefully that you can hardly find any flaws. He has not only mastered the storytelling, but the way he dealt the emotions is unbelievable. Director Sukumar didn’t deviate from the main plot. Ram Charan’s Top notch acting will keep your jaw struck, His dialogue delivery, expressions both subtle and intense very excellent. The look and getup were just amazing. Undeniably there is no replacement for Ram Charan in this film. The Music, Cinematography, makes the film so refreshing. Ram Charan and Samantha are beautifully rustic in their roles. They share a good on-screen chemistry. The character of Chitti Babu undoubtedly steals the show. It remains the highlight of this film forever. Coming to the film set in the 1980s, the first half of the film sees Ram Charan essay the role of Chitti Babu, a partially deaf individual who’s full of life. He runs the motor that water the fields in the village he resides in, Rangasthalam. Beautifully innocent, he carries the blissfully ignorant character of the atrocities carried out in his village by President (Jagapathi Babu). In the second half, we can see huge emotions and some twists in the story. The movie is shown in a very rustic and raw manner. Ram Charan outstanding performance. You will see a newborn actor in Charan. Superb performance by Aadhi Pinishetty, Jagapathi Babu, Anasuya. This film will define Ram Charan career as before Rangasthalam and after. Ram Charan’s fantastic act as Chitti Babu wins your heart. Don’t miss to watch this Cult Classic Village Saga.